The main differences between the RecSea dial + gimbal and Nauticam ones are obvious. 02. Nauticam chooses to use 4+1 middle buttons and 1 separate dial to operate the Tri-Nav controls. 03. RecSea tries to kill two birds with 1 stone by using a dial + 1 middle button, where the dial is also operating 4 buttons the north-south-east-west. RecSea dial and gimbal is probably was OK for S100 version of Tri-Nav, but for Sony's Tri-Nav, this is a user nightmare due to the obvious design differences of both brands Tri-Nav assembly. Nauticam separates the dial spinning movement by using a gimbal with a middle part being a friction pad and able to spin independently of the gimbal itself . The rotation of the friction pad I marked green no 6 is controlled by a separate dial. So the gimbal is a two part component but assembled and look like 1 part. This way the north-south-east-west 4 buttons on the housing exterior, can remain as just buttons. Gone are the accidental push. 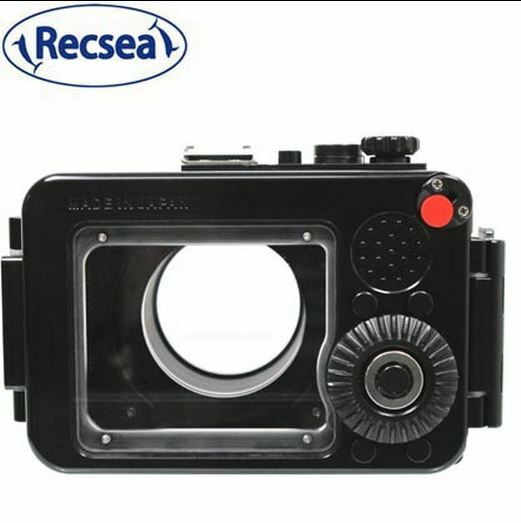 RecSea uses a dial and a middle button. The RecSea dial can act also as switches for the 4 buttons, the north-south-east-west. They should know such design will NOT WORK as expected in a Sony RX100 type Tri-Nav. Sony's TriNav requires a gimbal as good as Nauticam one and a separate dial. The Sony Tri-Nav requires only so little pressure to activate any of the 4 micro switches I called the north-south-east-west buttons, let use an example of 10 grams of pressure. RecSea dial being exposed sea water pressure, will need spring to counter that sea water force. That very spring will have more grams force per mm movement compared to the Sony's Tri-Nav micro switch, I guarantee you that and you can test it yourself. If this RecSea is rated at 65 meters or 7.5 ATM, we are looking at 7.5 BAR of pressure or 110 psi of sea water pressure able to act upon any control ( dial & buttons ). The exact force can be calculated if we know the actual components used. For simplicity sake, I can tell you that RecSea must use spring/s to counter that water pressure and it is not super soft one like the Sony Tri-Nav micro switch uses. Only trigger type lever is not effected too much by sea water pressure due to its method of action/movement. Any push in push out action of a button will be effected by sea water pressure. So the delicate Sony Tri-Nav micro switches activation pressure will be so much lower than the spring counter pressure being used on that RecSea dial+gimbal to oppose the sea water pressure. What we will get is lost of feel. Loss of feel is loss of precise control. The RecSea dial let say, needs 20 grams to overcome its spring pressure for push to ON action. A Sony Tri-Nav needs let say 10 grams. How would you sense the Sony's Tri-Nav buttons being activated, if the work effort of over coming the dial+gimbal spring pressure alone is 20 grams ? When user needs to spin a RecSea dial, he must exert force to create some friction on the dial's jagged surface. Exerting force is like pushing, same thing. So it is easy to accidentaly push any of the 4 north-south-east-west buttons while spinning a RecSea dial. Simply its is because the dial is also a push button assy. Nauticam on the other hand, realized that if a spinning dial needs a spring to counter sea water pressure and that dial in itself is also a push button switch......no precision of operational control could be achieved, so they made an additional dial just to spin the Sony's Tri-Nav and must come up with that special two-in-one gimbal with a spinning part in the middle. By not using a dial like RecSea, Nauticam can use 4 north-south-east-west buttons where its placement is 100% exactly as the position of the Sony's Tri-Nav 4 micro switches. The illusion of Sony's spinning dial makes people forget that there are permanent non move-able 4 micro switches at north-south-east-west position. RecSea single dial that can also perform push-to-activate the north-south-east-west buttons can be compared to someone pushing an object with a bent shaft, that is wasting energy and that is the root cause of operational precision loss or accidental ON. RecSea dial has middle shaft so that it can spin, but that dial also need to be able to "sink" towards north-south-east-west , its like having a flexible center or a shaft with ball joint. RecSea dial as a concept is brilliant, trying a 100% to be like Sony Tri-Nav but it can't work underwater thru mechanical transfer of RecSea dial + gimbal, compared to our fabulous finger doing the same thing directly on Sony's Tri-Nav on land. No mechanical device can mimic easily our super wonderful finger because we have the sense of touch, we know we touched something simply by laying/applying 1 gram of force on that object or switch or by temperature difference. This is why many people need a keyboard to have that distinctive click. While on a touch screen like iPad, a minor tone or visual color change on virtual keyboard toots is required to replace that mechanical "click" sensation. 6 Happy Easter- Is this a hand holding a cross? 4 Owners: Sony RX100 M5 vs M6?